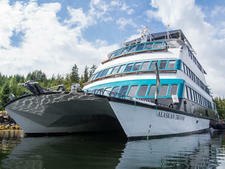 Allen Marine picked up the former Spirit of Columbia from Cruise West when the latter company went under in 2010, with the intent of bringing its Alaska expertise to the overnight cruise market. Built in 1979 for American Canadian Caribbean Line (now known as Blount Small Ship Adventures), The refurbished ship launched in 2011 as Admiralty Dream for the new Alaskan Dream Cruises. Typical for an expedition ship, its six classes of cabins are on the smaller side, ranging in size from 74 square feet to 135 square feet (the Owners Suite). The toilet and shower are in the same small bathroom, separated by a plastic curtain, while the sink stands alone inside the main cabin. Toiletries include Alaska-crafted soaps and shampoos. There is no Wi-Fi, television or telephone; cell service can be restricted, especially outside the larger ports. The main dining room features made-to-order meals, with open seating. Social hour, drinks and daily recaps from expedition leaders are held in a small forward lounge, which serves as the ship's primary gathering spot. While there's no fitness room or spa, there's an exercise bike and elliptical machine under the covered portion of the sun deck. As with all of the line's ships, Admiralty Dream has an open bridge policy. As with all Alaskan Dream itineraries, a cruise on Admiralty Dream includes a stop at Hobart Bay, native-owned land where other cruise lines can't dock. The company uses this stop as a "play day," giving passengers the opportunity to kayak, drive Zegos (small jet boats) and RTV's over logging roads. Most cruises also include a stop at Orca Lodge, an island outside Juneau that's owned by Allen Marine; it's used as a base for an evening king crab feast, where you can eat as much seafood as you want and cook s'mores over a campfire. 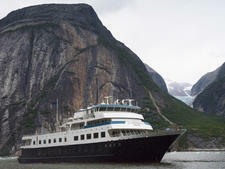 Motorized skiffs give passengers a closer view of fjords, glaciers and wildlife on shore. 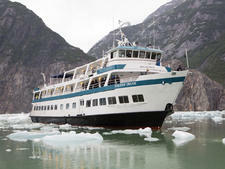 Itineraries that include Glacier Bay feature onboard narration from a National Park Service ranger and a full day of viewing the park's glaciers and wildlife from the ship..